The scissors you use when cutting hair can make or break the final style. Hair cutting scissors or shears differ from other types of scissors in the level of precision and fine detail that they can provide. Whether you’re a professional hair stylist, a cosmetology student, or just someone who is very passionate about hair styling, having a great pair of hair scissors can make your work much easier. In this article, we’ll break down the basics of shopping for the best hair cutting scissors, and review a few of the best hair scissors on the market. Best Hair Cutting Scissors1. Equinox Professional Razor Edge Series2. Utopia Care Professional Barber / Salon Razor3. Sanguine Professional Mustache and Beard Trimming Scissors4. ShearGuru Professional Barber Hair Cutting Set5. Got Glamour Hair Cutting ScissorsWhat are hair cutting scissors, and how are they different from other types of scissors? There are many different models of hair cutting scissors to choose from. However, some models are better than others, so we’ve compiled a list of the best hair shears. 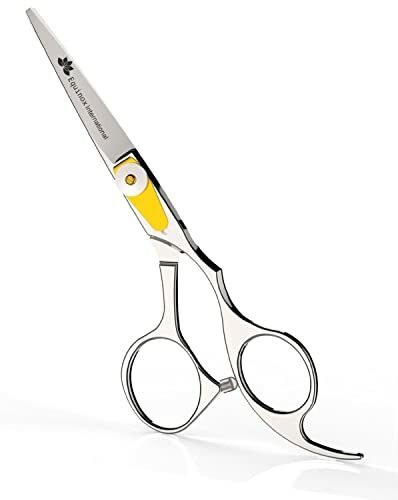 We love these shears because they provide great quality cuts and are very accessible. These scissors are some of the most popular on the market, and it is very easy to see why they are so well-loved. They are made with Japanese stainless steel, which is extremely durable and has a nice finish to it. The handle grip is quite long and really cradles the fingers, which makes it much easier to get a good grasp on what you are doing. It also prevents the fingers from sliding, cramping, or just generally getting uncomfortable. The blades are quite sharp, delivering a very precise finish. However, it is important that these are stored and used safely to prevent any injuries. These shears are very light, at just under five ounces, and they are only 6.8 inches long. Their small size makes them ideal for home use, but they are also quite portable, which makes them ideal for hair students or professionals as well. 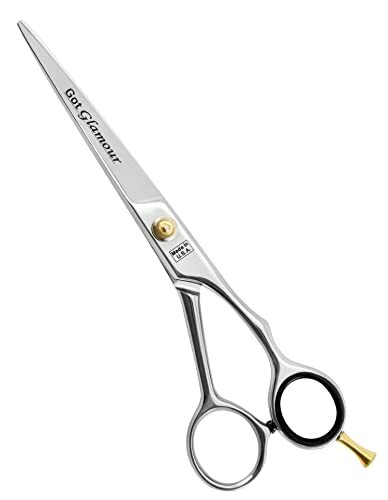 These classic scissors work very well for delivering a haircut with a clean finish. They are made entirely from Japanese stainless steel and are very durable. They come in a few different lengths, so you can choose the one that best fits your needs. The blades on these scissors are quite sharp and have a convex shape to prevent them from wearing down over time. They have a gold-plated knob and tension adjustment system, so you can choose how tight or loose you want them to be. While the holes for the finger and thumb are a bit small, they do come with rubber inserts to make them more comfortable. The scissors also come in a protective travel case, which is a big bonus for anyone who uses hair cutting scissors professionally. 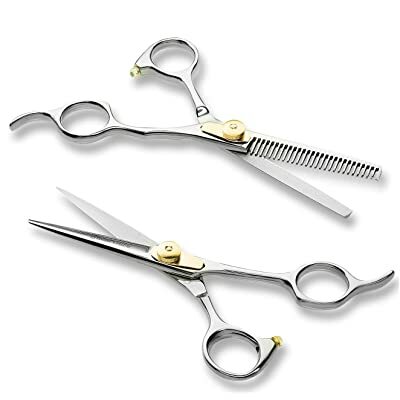 These scissors are great for extremely precise trims - we found them to be some of the sharpest you can get. They are incredibly durable, and are made from Japanese steel with a black finish. The scissors have an ideal level of resistance, so you can cut smoothly and easily without having to do any extra, unnecessary maneuvering. The scissors have very large, comfortable finger holes for a great grip, and they are quite substantial compared to others on the market. The tension level on these scissors is adjustable, so you can decide how much you need when working on your hair. This hand-crafted set of shears is a great investment for anyone who cuts hair. It is made of Japanese stainless steel that is meticulously sharpened during creation and lasts for a very long time. The tension screw is custom designed to be very precise and easy to use, so you can adjust the scissors to be just how you like them. They also have long, comfortable finger grips that are designed to reduce tension as you cut. The company also provides a lifetime guarantee on these scissors and is known for great customer service, so they are ideal for anyone who really needs a workhorse pair of scissors that will last them a long time. 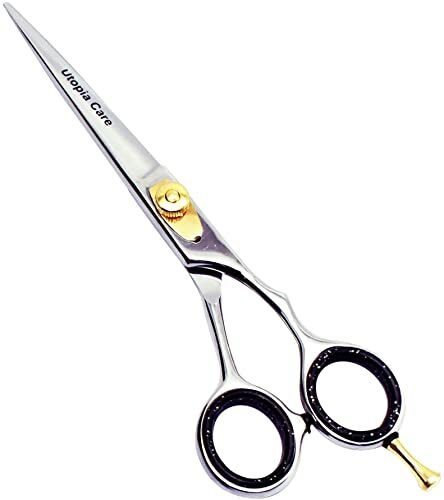 These shears are made from high quality cobalt molybdenum, which is a very durable mineral that stays sharp for a long time. They are very smooth and quiet to use, with an adjustable screw for customization. They also have a rubber grip on the inside of the finger holes for extra comfort, and only weigh 1.4 ounces. The lightness of these scissors make them very easy to use for long haircuts. They provide great quality for beginners and are quite compact. What are hair cutting scissors, and how are they different from other types of scissors? The first thing many new shoppers wonder when buying hair cutting scissors is how they differ from other scissors. Hair shears are designed specifically to give a nice finish to the ends of the hair, and are fine enough that they can do very detailed work. They have fairly long blades and circular handles with grips on the outside. Since the blades are relatively thin, it’s easy to cut small sections of hair at a time. Although you may be tempted to cut your own or someone else’s hair with a pair of traditional scissors, it really helps to invest in a good pair of hair shears (even if you’re not a professional). Scissors that are dedicated just to cutting hair will be able to make much cleaner cuts, and they usually tend to be much easier to hold as well. There are a few things you should look for when shopping for hair cutting scissors. Since they are used for such a specific task, they need to have a few important features. The first is the blade. It needs to be sharp and hard, because the harder the blade is, the easier it is to get a clean line when cutting hair, and it also creates uniformity in terms of the ends of the hair. The scissors should feel smooth when opening and closing them, so if you can, try to test them out at a store before purchasing. You’ll also need to take into account the handles on the scissors. Although there are a few different ways that manufacturers can choose to make the handles, they should always have a comfortable grip that doesn’t squish your fingers or cause cramps while you’re working. They should also be made from a durable material that isn’t going to wear down over time. Scissors also come in different sizes, depending on the shape and size of your hands. Ideally, your scissors shouldn’t be much longer than the length of your hands, but you should go with what is going to be most comfortable for you. If you are a hair student or professional and plan on using the scissors often, you’ll also want to make sure there is an easy way to sharpen the blades. Many scissors can easily be unscrewed and reassembled with just a simple screwdriver. This is important for the longevity of your scissors so you can continue to use them for several years. In addition to the functionality of the scissors, many people like to spend their money on products that look nice. There are many hair scissors that have an appealing design and come in a variety of different colors. You may want to take this into consideration while shopping if you want your beauty products to be very aesthetically pleasing. There are many great options out there for anyone who needs high quality hair cutting scissors. We like all the options on this list because they are very sharp, durable, and easy to use.